« NEWLY AVAILABLE PREORDER ITEMS AT LADY DEATH STORE! SCOTTSDALE, ARIZONA (June 21, 2017) – Coffin Comics announced today that the Coffin Comics Festival has been postponed. The event is a weekend celebration of all things Lady Death and includes the grand opening of: The Lady Death Museum, The Coffin Comics Company Store and The Crypt of Lady Death. The new dates are scheduled for February 9-11, 2018. Coffin Comics apologizes for any inconvenience this decision may have caused. The good news is that the new dates have special significance to the history of Lady Death. Lady Death #1 was released on February 9, 1994. The Coffin Comics Festival will now take place on Lady Death #1’s 24th Anniversary! Tickets for the festival will now go on sale in late September. Expect more announcements, including guests, ticket pricing and enhanced VIP experiences in the near future. 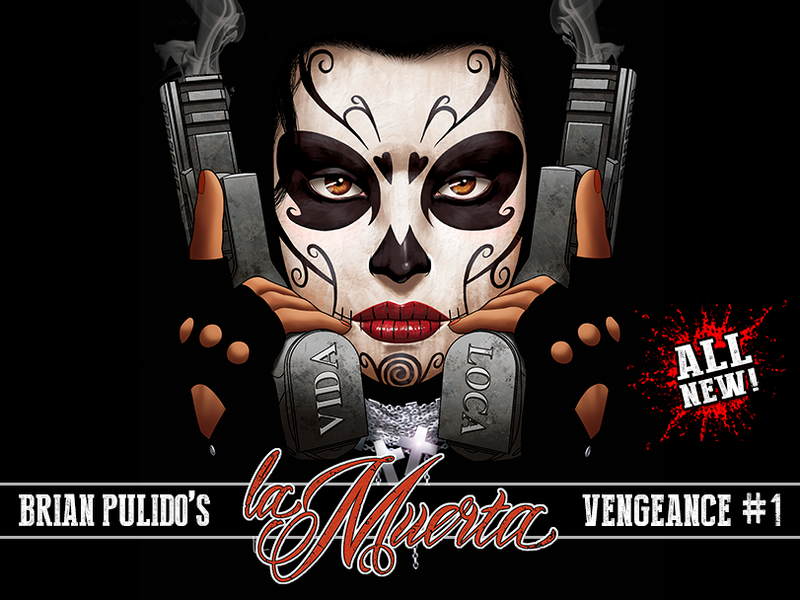 THE LA MUERTA #1: VENGEANCE CAMPAIGN ON KICKSTARTER IS ON FIRE!!! TOP REWARD TIERS NOW GET THE CHANCE OF RANDOMLY INSERTED ORIGINAL ART! With well over 600 backers and over $45,000 pledged in less than a week, the La Muerta #1: Vengeance Kickstarter campaign is ON FIRE! THANKS to everyone who has already pledged to the campaign! Your generous support has made the next chapter of La Muerta possible and we’ll be shipping the new book in September! Plus…we have just made things a little more interesting! The VENGEANCE HIGH ROLLER COLLECTION and VENGEANCE ULTIMO MEGA BALLER SET reward tiers now have the random chance to receive one of over a dozen pieces of original La Muerta art by series artist Joel Gomez! We only have a few spots remaining in these top two reward tiers, so be sure to get your pledges in before they’re all gone! This entry was posted in News, Product News, Product Releases and tagged joel gomez, kickstarter, la muerta, lady death, original art, vengeance. Bookmark the permalink. Both comments and trackbacks are currently closed.